CarGurus has 74,588 nationwide Explorer listings starting at $750. The 2016 Ford Explorer Sport would have made an excellent Bluesmobile. 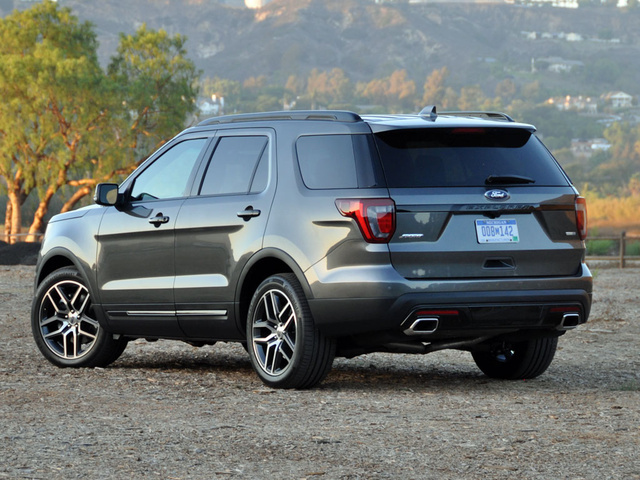 For 2016, Ford refreshes the popular Explorer by updating the styling, upgrading the available features, offering a new and more efficient engine option, and adding a new Platinum luxury trim level. Collectively, the changes make the 2016 Explorer the best one yet. Unfortunately, Ford failed to fix one of this crossover SUV’s only real flaws, making it hard to recommend the Explorer. The 2016 Explorer Sport would have made an excellent Bluesmobile. It's just one of several Explorers to choose from, ranging in price from the base Explorer at $31,645 to the new luxury-oriented Platinum trim at $57,405 with all of the option boxes checked. My Explorer Sport test vehicle wore a window sticker of $51,290, including a destination charge of $945. Options for my test vehicle included a dual-panel sunroof, an adaptive cruise control system with forward-collision warning and brake support, and a set of 265/45 summer performance tires. However, a big chunk of the extra change was wrapped up in Equipment Group 401A, which installs a long list of extras. Highlights include a blind-spot warning system, a navigation system, a hands-free power liftgate, heated and ventilated front seats, and a slew of convenience features. The Explorer Sport gets a special blacked-out appearance, lending attitude along the lines of the Police Interceptor model. Ford has also updated the Explorer’s styling for 2016, adopting a more angular look that reminded both my wife and I of a Range Rover. Granted, we'd been drinking some wine while gazing upon the Explorer in our driveway, but you can see what we’re talking about, right? 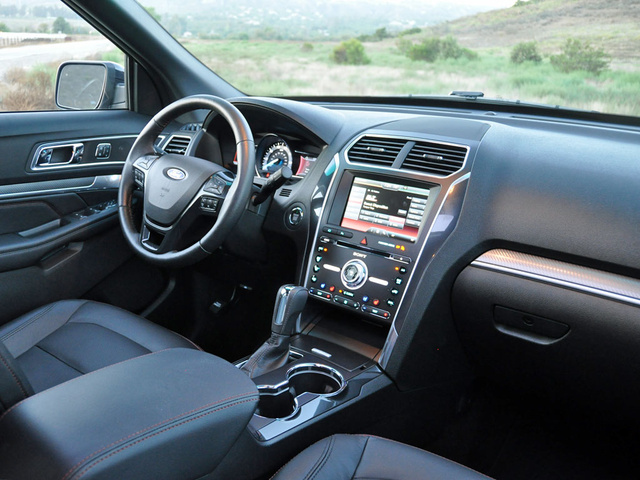 Inside, the new Explorer looks similar to last year's, and despite the long list of upgrades for the 2016 model, this family-size crossover SUV doesn’t get Sync 3 technology, which is the name of Ford’s next-generation infotainment system. 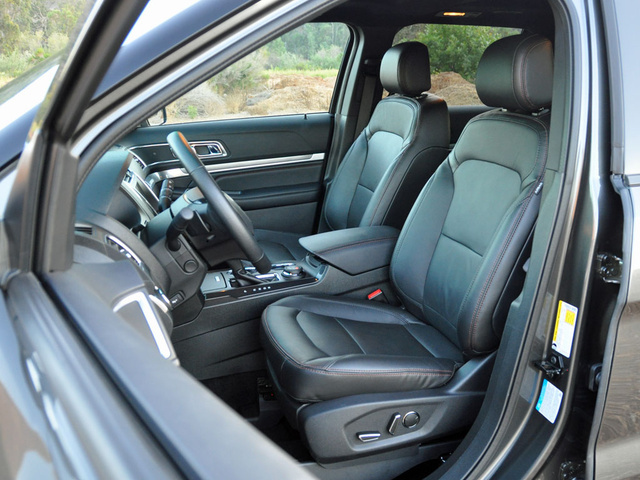 By the way, I hope you like black, because that’s the only color for the Explorer Sport’s cabin. Three engines are offered for the 2016 Explorer. The standard power plant is a 290-hp 3.5-liter V6. A new turbocharged, 2.3-liter 4-cylinder engine is an option, making 280 hp and 310 lb-ft of torque, effectively providing more torque combined with a bump in fuel efficiency. 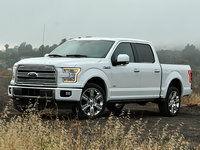 A twin-turbocharged 3.5-liter V6 is reserved for the Sport and Platinum models, good for 365 hp and 350 lb-ft of torque. All Explorers have a 6-speed automatic transmission with a Sport driving mode and paddle shifters, delivering engine power to the front wheels in base, XLT, and Limited trims. The available all-wheel-drive (AWD) system, which is standard for the Sport and Platinum trims, includes Hill Descent Control and a Terrain Management System with driver-selected Normal, Snow, Sand, Mud, and Hills drivetrain settings. Depending on how an Explorer is equipped, the maximum tow rating is up to 5,000 pounds. Feeling quick rather than downright fast, the Explorer Sport’s twin-turbo V6 has more than 4,500 pounds of crossover SUV to motivate, and that’s before adding passengers or cargo. A muted rumble of an exhaust note accompanies acceleration, making the engine sound as much like a V8 as is possible. The combination of rapid response and a throaty growl is satisfying, if not exactly thrilling. Prepare to visit gas stations on a frequent basis. According to the EPA, the Explorer Sport should get 16 mpg in the city, 22 on the highway, and 18 in combined driving. Based on my testing, these estimates are optimistic. I averaged just 16.7 mpg, despite several highway trips. Although equipped with a Sport driving mode and paddle shifters, I found the transmission most satisfying when left in Normal mode. In my experience, in Sport mode, it regularly demonstrated a tendency to either downshift or upshift at inopportune moments. Also, I didn’t find the paddle shifters particularly useful, because Ford has done such a good job of isolating the drivetrain from the cabin. This makes it harder to aurally identify high-rpm engine operation and to detect gear changes, and the tachometer and selected gear displays are too small to easily reference when driving the Explorer Sport with spirit. Every Explorer comes with Curve Control, which automatically brakes an inside wheel to tighten the Explorer’s cornering line if the driver enters a turn with too much speed. All models equipped with AWD have a thicker strut tower brace for 2016, and the Explorer Sport also benefits from a sport-tuned suspension, quicker steering, a 3.16 rear axle ratio, and 20-inch wheels with 255/50 tires. Note that my test vehicle had summer performance tires, sized 265/45, which really helped improve handling. These performance-oriented upgrades give the Explorer Sport a taut, controlled ride and plenty of grip to go along with the engine’s power and performance. On twisty mountain roads, though, the steering felt a little bit light, and because temperatures on testing day approached 90 degrees, the brakes exhibited fade, making me wish that the Explorer Sport were the beneficiary of the bigger brakes used in the Explorer Police Interceptor model. Under normal conditions, though, the brakes proved stout and responsive. The greatest challenge associated with driving an Explorer pertains to perceptions of size and restricted outward visibility. When you’re sitting behind the steering wheel, on seats that feel a little too small and are located too far away from the doors, this SUV feels much wider than it actually is. Additionally, the windshield pillars are massive, the side mirrors are relatively small, and the hood is long and imposing. As a result, parking is tricky without the available front and rear parking sensors. Ford also offers a new Enhanced Active Park Assist system for the Explorer, one that steers the SUV into parallel and perpendicular parking spaces while the driver operates the transmission and pedals. It can even help the driver extract the Explorer from a space if it has been boxed in too tightly, thanks to Park Out Assist. While recent data gathered by J.D. Power shows that people don’t really care much about such systems, I’d argue that this technology is actually useful to an Explorer’s driver. Generally speaking, the Ford Explorer feels robustly engineered, and in more expensive trims such as my test vehicle, the interior materials and design elements make this Ford look and feel like a luxury SUV. This is a quiet vehicle, too. What’s lacking, though, is a more palpable level of refinement and attention to detail that is common in vehicles priced higher than $50,000. For 2016, Ford changes the center dashboard controls from a touch-sensing panel to one employing real knobs, buttons, and rocker switches. As a result, they are much easier and less distracting to use. MyFord Touch is the company’s infotainment system, and it includes an 8-inch touchscreen. Refined over the years, MyFord Touch is easier than ever to use but remains less than ideal in terms of layout and touchscreen response speed. Previously, I mentioned that the Explorer’s front seats feel undersized and are located too far away from the doors. Don’t take this to mean that they’re uncomfortable. Quite the contrary, actually, and if you get the Limited or Platinum version of the Explorer, you can opt for multi-contour front seats, which massage you as you drive. During a hot week in Southern California, though, I did wish the ventilation function worked with greater gusto. Adults with lanky legs might find the second-row seat to be a snug fit, but the front seat backs are softly padded, and the bench seat provides good thigh support combined with plenty of foot room. One thing to note about Explorers equipped with the optional inflatable rear seat belts is that the seat-belt anchors are rigid, making it very uncomfortable for an adult to ride in the middle section of the second-row bench seat. The third-row seat is sized to hold an adult, in comfort, for more than a few minutes. This is a rarity in the segment. While it is not advisable for adults to ride back here for multi-hour trips, kids will be fine. 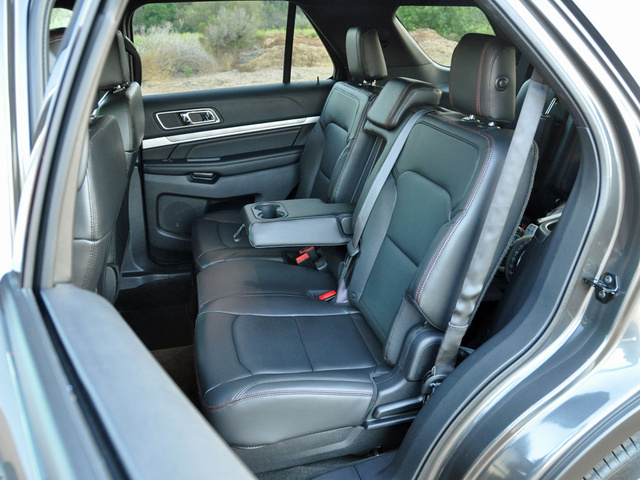 Also, while the safest place for children is the second-row seat, the Explorer does provide a decent amount of distance between the third-row seat back and the tailgate, adding parental peace of mind when kids must ride in close proximity to the rear of the vehicle. Another rarity in the segment is that the Explorer can carry an appreciable amount of cargo at the same time that it holds three rows of passengers. 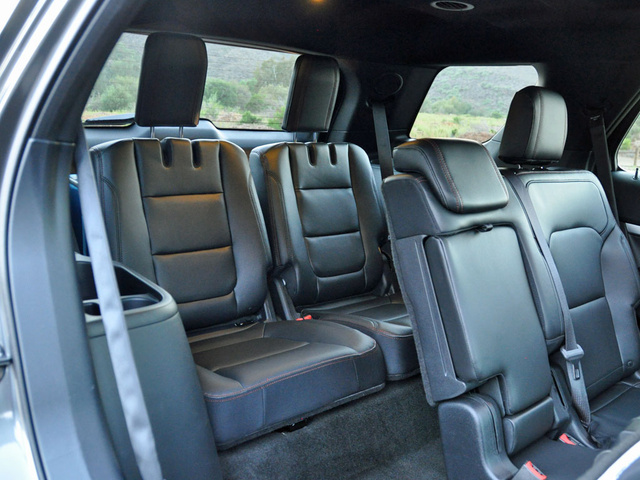 Because the third-row seats tumble and fold into the floor when not in use, similar to those in a minivan, the Explorer has a sizable well behind the third-row seats that measures 21 cubic feet in terms of volume. When both of my test vehicle’s power-folding third-row seats were tucked into the Explorer’s floor, space expanded to a generous 43.9 cubic feet. With the second-row seat folded down, maximum cargo capacity measured 81.7 cubes. Loading the Explorer is easier for 2016, too. A hands-free power rear liftgate option is available, automatically opening and closing the cargo area if your hands are full. Operation requires you to wave one foot under the bumper, though, so make sure you’re not standing on ice when you attempt to use this feature. In addition to Enhanced Active Park Assist and a hands-free power liftgate, the 2016 Explorer can be fitted with new smart-charging USB ports in the front and rear parts of the passenger cabin, as well as front and rear camera systems that include washers for clearing dirt, debris, and other impediments to vision. The front camera provides a 180-degree view of what’s ahead and to the sides of the Explorer, making it easier to pull out of blind driveways, parking lots, and streets. What the refreshed Explorer doesn’t get for 2016 is a replacement for the MyFord Touch infotainment system. While the automaker has steadily improved and refined MyFord Touch over the years, it remains less than ideal in terms of the size of its virtual buttons, touchscreen responsiveness, and general look and feel. Ford is ready to roll out a new Sync 3 technology that is designed to replace MyFord Touch, offering a user experience closer to that of a traditional smartphone or tablet computer. However, this new, more modern system is not offered for the 2016 Explorer. According to a report by NBC News, 25 percent of all auto accidents are small-overlap frontal impact collisions. In other words, a quarter of all crashes involve an impact on the front corner of a vehicle. Because protecting a driver or front passenger in these types of collisions has the potential to save many lives, the Insurance Institute for Highway Safety (IIHS) began rating protection levels for these types of collisions back in 2013, and the Explorer received a Marginal rating in this test. Given that the Explorer was last completely redesigned for the 2011 model year, this is not surprising. What is surprising is that for 2016 Ford has basically restyled the Explorer from the windshield forward, yet the company apparently elected to make no structural upgrades to improve crash protection. As a result of this decision, the 2016 Explorer retains its Marginal small-overlap frontal-impact test result from the IIHS. Ford’s failure to upgrade the Explorer’s structure during this refresh is disappointing, especially given this crossover SUV’s role as a people hauler. Plus, because the optional forward-collision warning system includes brake support technology instead of an automatic emergency braking system, there is greater potential for a small-overlap collision to occur in the first place. In other crash-protection assessments, the Explorer performs to an impressive degree. Plus, when you pair a smartphone to the SUV’s Bluetooth connection, you get free 911 Assist technology, which is designed to help speed rescuers to the scene of a collision following an airbag deployment. Also, let’s not forget that Ford is still the only car company offering inflatable rear seat belts, which help to cushion rear-seat occupants against crash energy in a collision. Nevertheless, I’m having a hard time understanding why Ford couldn’t strengthen the Explorer’s structure in order to improve that IIHS small-overlap frontal-impact rating. Other companies, most notably Honda, have shown that this can be done during mid-cycle refreshes of vehicles, so the cynic in me thinks this upgrade got crossed off during a meeting, making it a cost savings measure. Unless you’re prepared to stop at gas stations with greater frequency, and to pay more for the premium fuel required to make maximum horsepower and torque, skip the Explorer’s twin-turbocharged V6 engine. It comes only with AWD, and is rated to get 18 mpg in combined driving, according to the EPA. During my week with the Explorer Sport, I averaged 16.7 mpg. The most efficient engine is the optional turbocharged 2.3-liter 4-cylinder, which is expected to get 22 mpg in combined driving in front-wheel-drive (FWD) versions of the Explorer. However, because this turbocharged 4-cylinder also requires more expensive premium fuel to make its maximum horsepower and torque, the most cost-effective solution might be the standard 3.5-liter V6 engine, which returns 20 mpg with FWD and 19 mpg with AWD. According to ALG, the Explorer is expected to do a good job holding its value over time, and several companies claim this midsize crossover SUV is slightly better than average in terms of the costs associated with ownership. 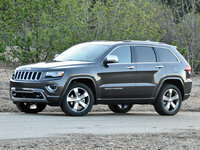 Historically, though, reliability hasn’t impressed owners responding to questionnaires from Consumer Reports and J.D. Power. Because the Explorer isn’t a class-leading vehicle, deals are regularly available to help keep the metal moving off dealership lots. 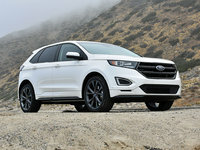 As this review was written, rebates and other incentives for the 2016 model remained modest, but Ford Credit was offering financing for as long as 84 months in order to help make payments more appealing. Had Ford done something to improve the Explorer’s crash-test rating, I would heartily recommend it. From the stylish design to the comfortable and practical interior, the Explorer is exactly the kind of vehicle most American families are seeking. But because families favor the Explorer, it needs to provide the best possible occupant protection it can. 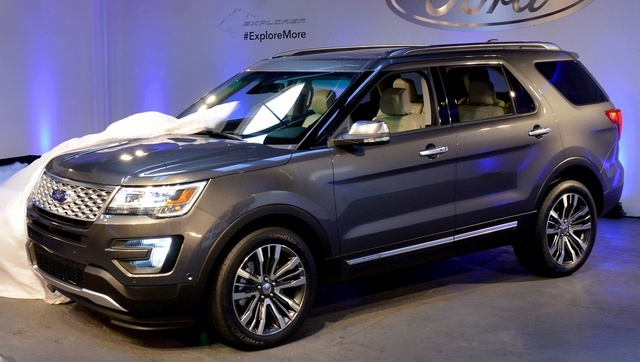 What's your take on the 2016 Ford Explorer? Users ranked 2016 Ford Explorer against other cars which they drove/owned. Each ranking was based on 9 categories. Here is the summary of top rankings. 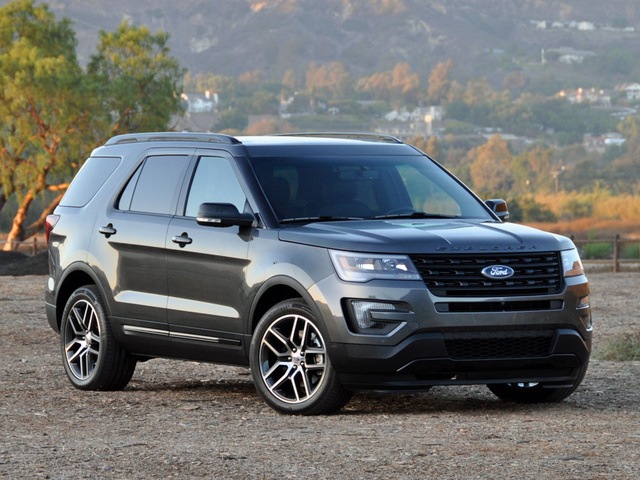 Have you driven a 2016 Ford Explorer? While driving my 2016 explorer today I noticed a strong natural gas like odor, then the car sputtered and died. What's going on? Whenever I have my low beams turned on only my driver side headlight flickers. I didn't figure it could be a alternator/battery problem due to it just being one.